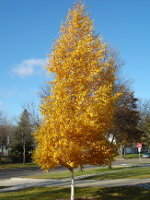 Dakota Pinnacle Birch is a hardy deciduous tree with a columnar to narrowly pyramidal form. 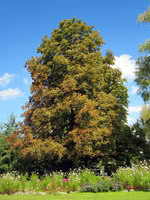 It makes a beautiful accent tree, and Dakota Pinnacle Birch is insect resistant and drought tolerant. Dakota Pinnacle Birch features smooth white bark and dark, green foliage that turns yellow in the fall.